The church at Perry Barr was built in 1831 as a chapel for the family and employees of Perry Hall, home of the wealthy Gough family. It became the focus of the hamlet of Perry and a scattered rural community. Map above reproduced from Andrew Rowbottom’s website of Old Ordnance Survey Maps Popular Edition, Birmingham 1921 licensed for reuse under a Creative Commons Attribution-NonCommercial-ShareAlike 2.0 England & Wales Licence. 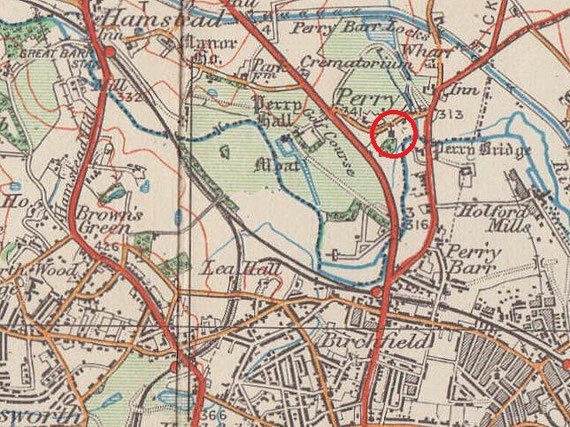 Even in 1921 Perry Barr was a rural hamlet well beyond the built-up area of the Birmingham. 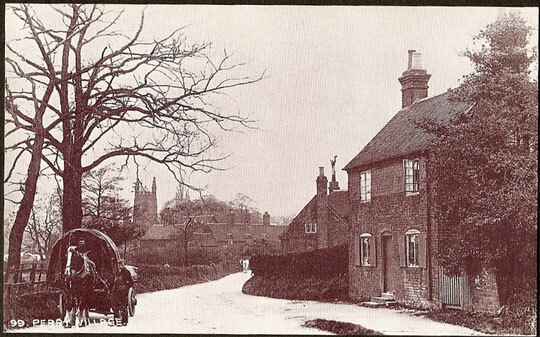 The building of the church of St John the Evangelist was started in 1831 wholly funded by John Gough of Perry Hall. A chapel of ease of St Mary’s, Handsworth some 2½ miles away, it was built effectively as the chapel of Perry Hall for use of the Gough family and their estate workers. The church was designed and built by architect-stonemason Robert Studholme of Sutton Coldfield. Although not a Commissioners' church, it was designed in the early Gothic Revival style much in the style of Commissioners' churches. The cost was some £10 000. The original building was a simple rectangle built of red sandstone and with a tiled roof with a crenellated west tower and small apsidal chancel. Plain lancet windows run the length of the four-bay crenellated nave which is supported externally by buttresses between each of the bays, each topped with a tall crocketed pinnacle; these were removed in the 1970s as they were no longer safe. There were porches at the east end of the nave which have since been replaced by transepts. Internally the walls were plastered and painted white; there was a west organ and choir gallery. The church was built orientated north-east/ south-west; it is not known why. The building does not lie parallel to the road and, when built, this was an unrestricted plot with was nothing here but fields. However, an east-west orientation, although often used, is not compulsory in church design and there are many examples of churches not so aligned. 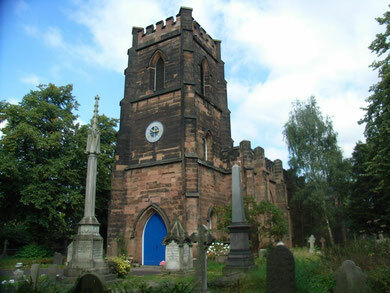 The church was consecrated in 1833 during the reign of Wiliam IV whose royal arms are displayed in the church, but it was to be another thirty years before a new parish of St John’s was created out of that of Handsworth parish. In 1888, the church was enlarged by J A Chatwin who added the extended elevated chancel, the organ chamber and vestries north and south of the chancel in Decorated Gothic style. In 1894 Chatwin also added the north and south transepts significantly increasing the size of the church; the west gallery was also removed. The enlargement of the church must have been for liturgical reasons than to cater for an expanding population. This was still a rural church in the late 19th century and there can have been little significant population growth in this area until the 1930s. However, Chatwin had been at work at the mother church at Handsworth from 1876-1880 and at nearby Aston from 1879, finishing in1890. It may well be that St John’s was enlarged and elaborated for reasons of status coupled with the need to express a more formal and ritualistic liturgy than was the practice when the church was originally built. The main entrance to the church is by the west door of the tower through the late-19th-century storm porch. The interior walls are plastered and painted white; the exposed timber roof has scissor bracing. In the south-west corner of the nave stands the half-spherical alabaster font on a base of clustered columns. The present pews are very likely a late 19th-century conversion of the original box pews. Chatwin’s north transept houses the Lady Chapel of 1938 which is separated from the nave by a glazed timber screen. Above the carved wooden altar and reredos, originally in the chancel, is a mural of c1938 depicting the Virgin and Child. The statue of the Blessed Virgin Mary dates from the 1980s. The landscape in the background shows the nearby Perry Barr zig-zag bridge and Lichfield Cathedral of which see Perry Barr was part before the creation of the diocese of Birmingham in 1905. The stained glass window of the Nativity, a bequest of Beatrice Lee, was designed and installed by Pearce & Cutler in 1938. The south transept window depicting the Epiphany is by Hardman’s. The moulded chancel arch has a drip mould with head stops; the hexagonal wooden pulpit stands on the north side of the arch. The chancel has pointed-arched windows and doors, all with drip moulds and head stops. At some time, probably during Chatwin's extensions, the chancel was elaborately painted, though this has since been lost. The east window depicts the Crucifixion. The altar and altar back are of carved timber. A doorway to the north gives access to the organ chamber into which is set a stained glass window by Thomas William Camm of Smethwick, depicting the young St John the Baptist. There are several classical memorial tablets of the mid-19th century, and an elaborate Gothic memorial to John Gough, the benefactor of the church. The living was described as a perpetual curacy in 1856, in the gift of Lord Calthorpe, and as a vicarage in 1869. The advowson was held by various members of the Calthorpe family and is now held by the current Lord Calthorpe. Originally there was a single bell cast by John Rudhall of Gloucester in 1833. This was replaced with a ring of 8 cast by Taylor’s of Loughborough paid for by parishioners in 1868 in memory of the 4th Lord Calthorpe who died that year. They were hung in a two-tier wooden frame, the treble being hung above the tenor. The trebles were retuned with bearings and gudgeons replaced by Barwells in 1888. There are now 8 bells in the tower, installed in 1972 from Bishop Latimer's Church, Winson Green using the old cast iron frame, rearranged to put the third and fourth on top. This peal started life at St John the Baptist, Deritend in 1776. After that church closed in 1939 the bells were recast by Taylor’s and taken to Bishop Latimer’s in 1958. However, the tower was not considered safe for ringing and they were last rung there in 1965. In 1971 the peal was transferred to Perry Bar. The previous Perry Barr bells appear to have been sold for scrap, probably to Taylor’s. Access to the ringing chamber is via a ladder flat against the wall and then through a trapdoor in the ceiling - not an easy task, but worth the effort. Acknowledgements Much of the information about St John’s is adapted from the church’s own website: See - http://www.st-johns-perry-barr.org.uk/. and Perry Barr & Beyond - http://www.perrybarrbeyond.pwp.blueyonder.co.uk/.